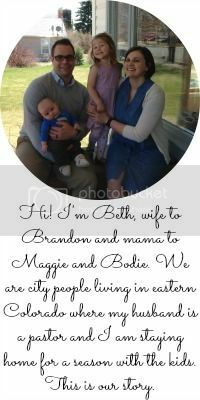 Hanging out with Maggie is only getting more fun! She's growing and learning new things all the time. 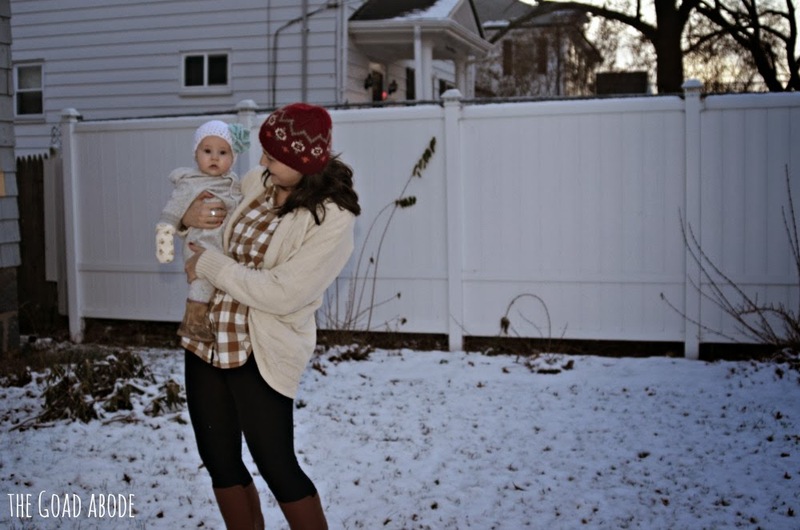 The past month was full of challenges, as we struggled through sleep regression, cutting her first two teeth and a growth spurt. There were days I went to work more sleep deprived than ever. More than once a coworker commented on how tired I looked. Thanks. Let this be my PSA for the week: do not comment on a new parent's appearance. No matter how well-intentioned it may be, hearing that you look as terrible as you feel is just not what you want to hear. 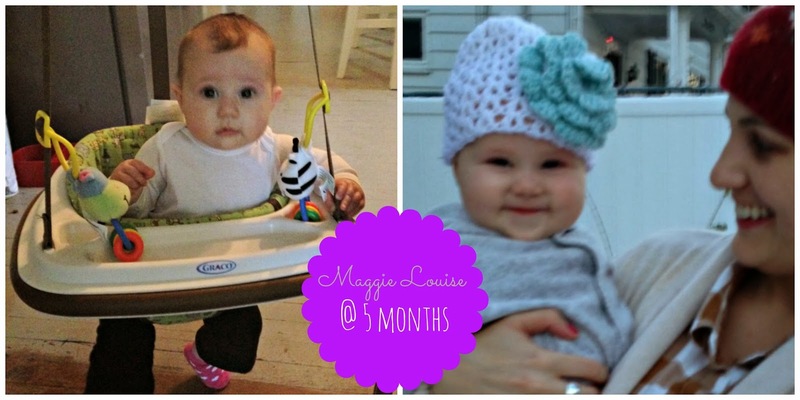 Despite feeling overly tired, we took plenty of joy in Maggie's development and growth throughout the month. She loves to squeal, especially in the middle of the night when she'd get awake. Her smile and genuinely happy state made it near impossible to be annoyed when woken by such happy squeals at 2 or 3am. Maggie also spent plenty of time laughing this month. She also really seemed to notice and watch our dog, Milton, this past month (notice he's in the background of the above photo). 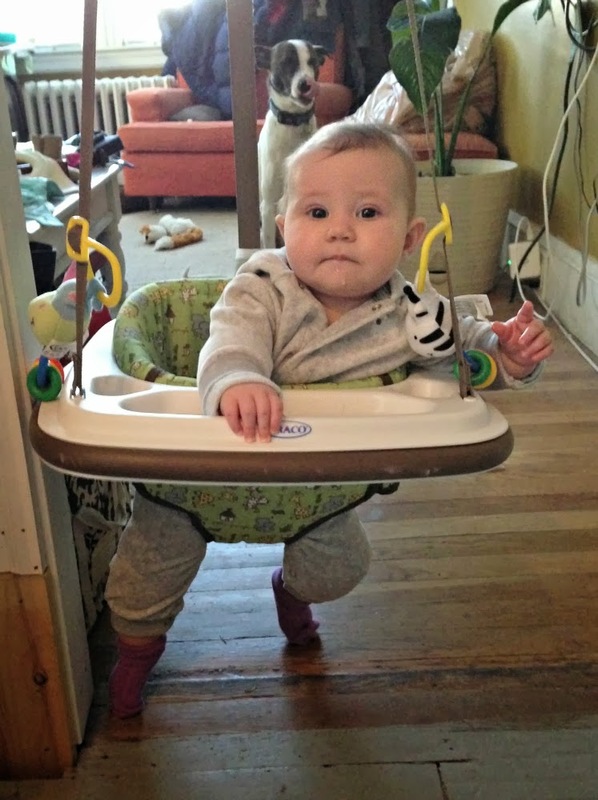 A few things you may not be able to tell from the photos: Maggie started kicking off her socks. She does not like wearing shoes and has kicked off her boots almost anytime they're on. I've learned to tuck her pants into her socks to keep them on her feet longer. 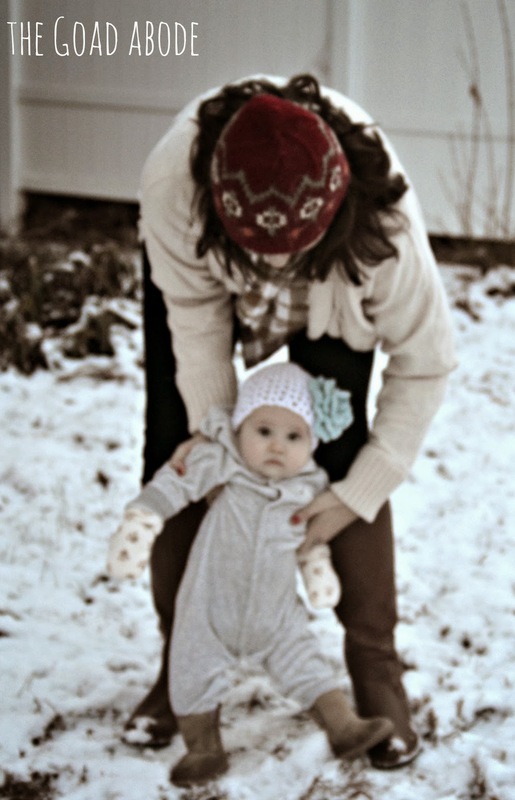 And thought it was a miracle the boots stayed on when we took her outside to get a few photos after her first snowfall. One thing I want to remember about the last month, is the first time she seemed to want just me. I came home from work one day and greeted her as usual, but when I left her for a few minutes to go the bathroom, she whimpered, making it clear I should hurry back. Her dad tried to console her, but she made it clear she wanted some time with me. My heart melted! She's such a sweet girl and it such a blessing to watch her grow. I have so much to look forward to in the month ahead, with lots more firsts!